South Korea will produce 6.2 million units of fuel cell electric vehicles and build 1,200 refilling stations across the country by 2040, in a major industrial push aimed at securing energy independence and assuming a leadership role in hydrogen technology. In its road map announced Thursday, the government said it would diversify the hydrogen supply portfolio, increase the supply volume to 5.26 million tons in the next 20 years and lower the market price of the energy source to less than 3,000 won per kilogram. The Seoul government will also support the industrial and domestic use of fuel cells for electricity and develop ships, trains and construction machinery powered by hydrogen, the Ministry of Trade, Industry and Energy said in a statement. The road map was announced in Ulsan, a southeastern industrial city with President Moon Jae-in in attendance. According to the plan, the number of hydrogen-powered vehicles in the country will reach 80,000 in less than four years and 1.8 million by 2030. The government will start providing subsidies for fuel-cell electric taxis and trucks while working with local governments to increase the number of fuel-cell electric buses to 2,000 by 2022. It also plans to start replacing all 820 police buses with fuel-cell electric buses in 2021. The subsidies, the government believes, will drive up production capacity and lower costs to around 30 million won, half the price of an FCEV sold on today’s market, by 2025. 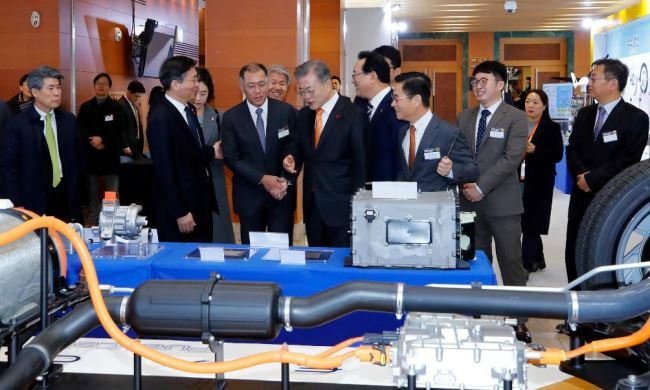 Stressing the government’s determination to pursue a hydrogen economy, President Moon said fuel cell technology would lead the country’s future growth. “For us, it is a golden opportunity that could fundamentally transform the state energy system and secure new growth engines (at the same time),” said Moon. The rationale behind the Korean government’s rather drastic hydrogen economy plans lies in the strong potential of hydrogen fuel to create new jobs and revive sluggish manufacturing businesses, including small and medium-sized companies. The aim of the government’s road map is to bring in fresh investment and create jobs in traditional industries such as steel production, petrochemicals and mechanical engineering, according to industry watchers. By 2040, the government expects to generate 43 trillion won worth of added value a year and create 420,000 new jobs in the market. Korea’s shift toward hydrogen as an energy source is also based on hopes of decarbonizing the country’s entire transportation fleet and reducing its heavy reliance on imported oil. The country relies on oil imports from the Middle East for most of its energy needs. Asia’s fourth-largest economy is among a few countries vying to secure the top position in hydrogen technology. Both China and the US have set their 2030 targets for hydrogen vehicles at 1 million, while Japan plans to provide 800,000 FCEVs across the country in the same year. Korea’s Energy Ministry believes the country could become a first mover in hydrogen technology, overtaking competitors such as the US and China. “We have world-class technology for hydrogen cars and fuel cells and also have (a significant) production capacity for hydrogen byproducts from petrochemical complexes as well as a (strong) supply network for natural gas across the country,” said Vice Energy Minister Jeong Seung-il. Both mass production and the goals in the road map are feasible, he asserted.